ST. GEORGE — Temperatures as high as 111 degrees are expected to combine with low humidity and gusty winds to create critical fire weather in Southern Nevada and Northern Arizona from noon to 9 p.m. Monday. 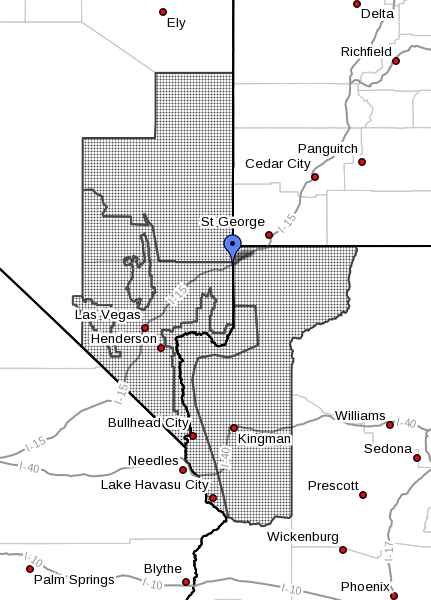 The National Weather Service in Las Vegas issued a red flag warning for Lake Mead National Recreation Area, Colorado River on the Arizona side, northwest deserts, northwest plateau, southwest Lincoln and Clark County deserts, Sheep Range, Spring Mountains and Las Vegas Valley. Winds will increase significantly by noon Monday and will peak in the mid to late afternoon hours before gradually decreasing Monday evening. South to southwest with sustained speeds of 15 to 25 mph and gusts over 35 mph are expected to combine with humidity values of 4 to 8 percent Monday afternoon. Any fires that develop will likely spread rapidly due to the combination of strong winds, low relative humidity and warm temperatures. Outdoor burning is not recommended. Heed all fire restrictions and use extra caution with any ignition sources. National Weather Service watches, alerts and warnings provide information to stay informed. Keep handy household items that can be used as fire tools: a rake, ax, handsaw or chain saw, bucket and shovel. Place a ladder against the house in clear view to aid firefighters. Place valuable papers, mementos and anything “you can’t live without” inside the car in the garage, ready for quick departure. If authorities advise or order you to evacuate, do so immediately. Keep vehicles fueled and in good condition with a change of clothes and emergency supplies inside. Watch for other vehicles, pedestrians and fleeing animals. If you expect to go to a shelter after evacuating, download the American Red Cross Shelter Finder App. Sounds like a great time to burn some weeds with a torch. Also sounds like a great opportunity for the feds to pay for more State of Utah fires. Wrong! The feds distribute the funding, we pay for it. We? I know that you are living on the government dole, so who exactly is we?